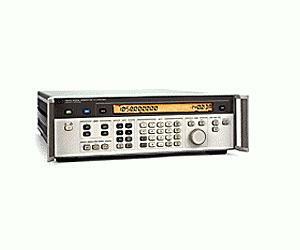 The Agilent 8642A synthesized signal generator is a high-performance, programmable signal generator for demanding out-of-channel RF receiver measurements and other stringent RF applications. It covers the frequency range from 100 kHz to 1057.5 MHz. This signal generator provides low SSB phase noise and spurious, high output level and level accuracy, and a full range of modulation types. The low-distortion internal modulation oscillator can be used to modulate the Agilent 8642A up to 100 kHz rates. This internal oscillator can also be used as an independent audio source with variable rates and levels.